Are you one of the millions of people who call your dog "baby?" If so, type "I" into the comment section below. Loving your dog like a child, racing home after work to let her out, leaving a party, planning trips, arranging play dates or trips to the park, scheduling daycare drop-offs, birthday parties, Gotcha days, etc. : dog lovers just get it. I get it. Dogs aren't just pets. They are a part of the family. As a professional dog trainer and author, I've been called out for being anthropomorphic: a fancy term used when people project human thoughts into an animal's behavior. I don't have a problem with that. I urge my clients to read their dog's posture and act accordingly, like they would to a child. In my mind you should coddle a dog when he's scared, redirect frustration and mimic dog laughter during play. Now begs the question: what's wrong with that? Sure, a decade ago dogs were considered domesticated wolves--some people felt it was necessary to pin, poke, and shake them to get them to behave. But that was yesterday's news. Today's science has shown us that dogs have more in common with toddlers than wolves. International research is confirming what dog lovers everywhere have always known: that dogs think, reason, communicate and feel. In a world where a growing majority of us call our dog's family, I'd say the gateway to an interactive, informative comparison between dogs and kids has officially been opened. Here are 11 ways dogs and children are similar. What are you thoughts on the subject? Join the conversation by entering them into the comment section below. It's Not What You Say It's How You Say ItResearchers discovered that dogs respond to what you say and how you say it! Sound familiar? Try asking a child to "do your homework" or "clean your room" in a whispery or whiny tone. Or don't bother, as it won't work. The Bark & Scream Loud and distressing, these tones create a jolt of fear and rush of adrenaline. If the goal is to quiet or calm a dog, yelling won't work! A Calm & Directional Tone This voice will direct a dog. It conveys confidence and authority. Think of a "pass the ketchup" tone. You wouldn't shout or sing this, nor would you say "pass the ketchup, ketch, ketchup." Excitement & Praising Sounds Happy and friendly tones will make a dog feel playful and happy. Dogs or kids the same rules apply! Dogs, like kids, don't know how to handle everyday situations. Both depend on us to tell them where they should go, and what they should do, in all situations. Children learn to associate words and routines; think tech or mealtime. Dogs can learn the same, but since English is their second language, they need a little more coaching. Take time to teach your dog 10-20 words, then use those words to direct him where to go and what to do throughout the day. Dogs, like kids, have five basic needs: to eat, drink, sleep, play, and go potty. Remember what you felt as a kid, stuck in traffic? How did you act when you were hungry, tired or hyper? Imagine if you teeth! Dogs and kids (and a lot of grown-ups) will do anything for attention. And they don't care if the attention is negative or positive. Stop mid-sentence when your kid screams "F--k" and you're guaranteed a repeat performance. Leap up from the couch when your dog grabs your napkin or steals a sock--same deal. What do dogs and kids (and many spouses and employees) want the most? Face time: a warm smile, heartfelt appreciation, some of your time. If you want to stop a dog from jumping or a kid from shouting at you, ignore them. Walk away, or block direct access to your face (I block my whole head with a pillow, magazine or my folded arm) until they calm down and act politely. Ever notice how behavior deteriorates when life gets wonky? It doesn't matter how many legs you walk on, stress shakes the metaphorical snow globe. Home renovations, parties, even arguments cause everyone to lose their grip. Kids tantrum when they can't have their way; it's frustrating to want what you want and not be allowed to have it. Tornadoes often erupt when kids and dogs are tired, overwhelmed or hungry. One easy way to shape anyone's behavior, according to BF Skinner, is to reward what you like and ignore the rest. Test it out: I guarantee this one works on all species (kids, dogs, partners, co-worker, etc). Make a list: place all the behavior you can't stand on the side labeled "Discourage;" on the side labeled "Encourage" write the things you'd like your dog (child, husband, mother) to do instead. Every time you get annoyed, disengage. Turn away, walk out of the room, hold a pillow or piece of paper over your face. Each time you get an "encourage" behavior, light up! Play a game of "Find It," offer attention, praise or snacks. Longing for more direct tips on a given behavior? Tune into my live streaming events where you can ask your question live and for free,shoot me an email, visit my Doglandia page, or search my site. Words draw mental images for both dogs and kids! Try losing the don'ts and focusing on the what to dos instead! When your kids are straddling the dog say "off the dog," instead of "don't sit on the dog." Encourage them to "breathe" when tempers are raging. Now try it on your dog: Instead of "No, Down, Get Off" when you're dog's jumpy, say "Get Your Toy" as you toss one; use "Kisses" when your dog's nippy, or "Potty Place" when your dog's circling. Tell them what to do, not what not to do. Kids backtalk and ignore their parents all the time, especially as they enter the tween years. Dogs have their own version of the teenage eye roll. Has your dog ever thought twice when you called to him? Is he blowing you off? Probably Has you ever feel like your dog is giving you the finger, or just tuning you out? I'm sure you're right. Their posturing and deadpan eye glares: backtalk and blow offs, canine style! Try play training techniques with your dog. Keep your interacts light and fun, tell your dog what to do instead of what not to do, and watch your relationship blossom overnight! Some of my favorite training games include Find It, soda bottle soccer and the Run Away Come Game. You'll play as your dog will learn a quick response to words like Sit, Stay and Come. What could be better than that?! 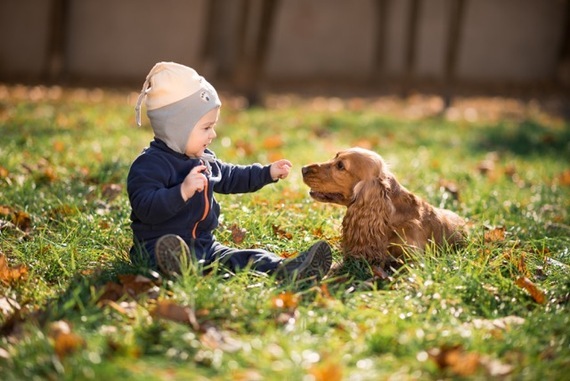 So whether you call your dog baby or your child your little pup ,you can improve your relationship with your dog by listening to parent experts just as you can hone up your kid's behavior with a quick comparison to the canine world. Meanwhile, let's help each other. Take a minute to add your sage parenting advice or puppy raising techniques to the comment section below this article. We'll share our discoveries and collect the best research from both camps. After all, life's an adventure. Call your dog and c'mon let's play!